....and of course you all know about the glorious Yarndale Bunting, right? The yarn bombing and the bunting were my two main, big, huge, ginormous creative projects for Yarndale, the things that I was personally in charge of pulling together. But as I was 1/7th of the official Yarndale Team, I also had a share in planning, preparing and organising much of the festival itself. There are a gazillion decisions and responsibilities that surface when one is involved in organising a festival of this size. If you stop to actually quantify it for more than a second or two, it is actually quite terrifying. It is such a huuuuuge undertaking. But all in all, I think for a first time stab at doing this, the Yarndale Team did amazingly well. There were only a couple of times during the four days when I personally felt a little overwhelmed by the responsibility of it all. Despite the extremely long hours and hard graft during the two set-up days, it was really great to see everything finally coming to fruition. This was especially true of the things we had designed and printed as it was the first time we had seen it all together. All those itty-bitty little decisions that were endlessly discussed, tweaked, altered, resolved and proofed had finally turned into something we could hold in our hands and be proud of. As we loved our patchwork sheep so much, we shamelessly used her gorgeous good looks to adorn the things we had designed. We had some super large cotton tea towels screen printed, as well as some lovely canvas bags (affectionately known as the Betty Bags), and they proved very popular with our Yarndale visitors. If you missed out on getting your hands on any of these yummy things, or weren't able to make it to Yarndale, there are a limited number of tea towels and bags currently for sale in the Yarndale online shop. But my favourite thing of all was the brochure we made. Oh, it is such a thing of beauty! Inside its pages, there is a heap load of festival information, including contact details for each of our 160 exhibitors. And as it says on the cover, there are also five (yes, five!) exclusive knit and crochet patterns. You might remember my own pattern contribution which I made back in July? I designed this dinky little Tweetie Bird brooch especially for the Yarndale brochure, and am actually rather in love with it! I'm thinking of making many more in jewel-bright colours to hang as Christmas decorations this year, maybe with little dangly legs and tinkly bell feet. But anyhoooo....back to the festival. I didn't take many photographs in the end as I was simply too rushed off my feet to do so. I took the above snap early on Saturday morning in that weird space of time before the visitors arrive, when everything is poised and ready to go. The atmosphere inside the building was AmAzInG. The very air felt like it was buzzing with anticipation and excitement. As one of the Yarndale organisers, it felt incredible to take a little walk up and down the empty aisles before the doors opened on Saturday, marvelling at the fact that it was no longer a dream and it Was Really Happening. We did it!! We really, really did it!!! The exhibitors did us proud. One Hundred and sixty talented, inspiring, passionate, friendly, wonderful businesses came to the first ever Yarndale and each and every one was a delight to behold. They all worked incredibly hard to transform the bare animal pens into a fantastic display of yarny colour and creativity. One of the exhibitors (Wigham Wool Work) created an amazing time-lapse video showing their experience of the festival from start to finish, and it makes for fascinating viewing (watch it on you-tube, it'll make you smile I guarantee!). Animals :: oh the animals! The alpacas and the angora rabbits were most defintely stars of the show I think, we had so many delighted comments from visitors about them. Yarn :: oh my, the yarn! There was more yarn at Yarndale than you could ever imagine. The sheer volume and variety of what was on display was breathtaking. Not to mention the colours. It was honestly incredible to see (and smooch) so much of it and I just couldn't get over the way it all looked and felt when it was gathered under one roof. The above yarn was part of a magnificent display by the Natural Dye Studio which made me gasp with pleasure every time I walked past. Buttons and haberdashery :: oooooo, yes indeedy! As a button-lover myself, I was delighted that we were able to welcome some gorgeous button makers and sellers to Yarndale. Handmade goodies :: yum, yum, yum! One of the things we most wanted Yarndale to celebrate was Creativity, and we were delighted to welcome a good number of talented textile artists with open arms. It was really, really wonderful to see such colourful and inspiring displays of knitted, felted, woven and crocheted pieces alongside the yarn, fibres and threads. So....aside from the top-notch retail therapy that Yarndale provided, not to mention the abundant inspiration, the other aspect to the show that we wanted to encourage and celebrate was the whole Social Thing. My own personal experience of creative social groups has had such a positive impact on my life, honestly it's hard to put into words really. The joy, friendship and sense of belonging that it gives me is immeasurable and I felt that if I could bring a little bit of that to Yarndale, then it would be a Very Good Thing indeed. Plus, I really wanted to make myself available to meet and chat with visitors, and hosting a Knit & Natter Lounge seemed like a good way to go about it. The area where I was to spend the weekend was truthfully a little bit on the grim side. If you can imagine a pretty dingy enclosed area, with lots of brick and wood panels and metal gates, with a distinctive air of Farmyard, then that is pretty much what I had to work with. This is a traditional farmers auction ring, complete with auctioneers rostrum, and a semi circle of tiered seating. My job was to dress it up and prettify it by adding as much yarn and colour as I possibly could. The entrance to the area was made very special indeed by this row of Attic24 Houses, all made from crochet. Aren't they lovely? My fab friend Heather worked her socks off to create these for me, and I absolutely love them, as did all the visitors. You can read all about the making of the houses in Heather's hooky housey blog post. We had bunting at our disposal of course, so, so, so much bunting. Once the exhibition hall was all decked out, we were able to use the rest to add some much needed charm and colour to the rest of the venue. Lots of bunting was strung up around the knit & natter lounge, then it was down to me to create a little bit of an Attic24 feel in my "home corner". This basically involved going home and scooping up as much of my crochet as I could possibly find, piling it all in the back of my friends car and using it to decorate the drab auction mart furniture. I think I did pretty good! My blankets, cushions and wreaths were joined by baskets of yarn and jugs of bright dahlias to create a welcoming and colourful Cosy Corner. And lets not forget The Funky Lamp! Lots of people came to see my yarn bombed lamp, it was lovely to share it with so many excited visitors and followers of my blog. I finished setting the scene here in my corner at 9pm on Friday night, and although I was feeling very tired and a tad nervous, I was also really looking forward to seeing the place fill with people the following day. And oh boy, did it FILL!!!!!! WOW!!!!!!! None of us had any idea how busy it would be, and we were completely taken by surprise. Many thousands of visitors arrived to stream through the doors on Saturday morning and the whole place very quickly became absolutely chocka-block full with people. There was such an amazing atmosphere with an almost palpable air of celebration, excitement, joy and friendship. It felt like one big giant party! I was kept very, very, very, very busy. I began just after 10am on Saturday and I did not stop all day. I had queues! I had crowds! I met so many lovely, gorgeous, happy hooky people. I talked (and talked and talked), I laughed, I hugged, I shared, I welcomed. I put every ounce of my energy into meeting the wonderful people who had travelled to to see me and making them feel welcome. I had my photo taken a gazillion times (which totally surprised me), and I signed autographs (which totally surprised me even more than the photos). And I listened too. I listened to the outpouring of excitement over the whole Yarndale experience, and I heard the appreciation for it all. I listened to travel tales and heard the wonderful way that people had been enjoying my home place (Yorkshire did look and feel glorious that weekend, basking in warm late summer sun). I listened to people exclaiming over the bunting and the yarn bombing and heard people so excited by all they had seen and bought. And I listened to a multitude of crochet related stories, each one unique, but each one with a common thread. I heard about the joy that it brings, the relaxation, the excitement, the friendship. And I soaked up the gratitude too. Wow, I was floating on a sea of gratitude, it was quite something! It was an overwhelming whirlwind of social, emotional stuff, and throughout the weekend I often felt moved to tears by the scale of it all. I was pretty much running on empty mind you, so everything did feel a little bit more intense due to fatigue I suspect. Lovely hooky friends of the world, you are amazing. You made my world spin during that weekend, honestly, it was the most incredible, wonderful, exhausting experience! It's been an odd thing to catch sight of my own face popping up on various blogs during the past few weeks. I am really not accustomed to being in front of the camera and am very much happier behind it. In some photos I look shattered beyond belief. In others, I look remarkably relaxed considering how far out of my comfort zone I was. I saw the above photo on Linda's blog and immediately loved it for it's honest and un-posed nature. That was me alright, laughing my way through the weekend in a blur of stunned happiness. So that was my own personal experience of Yarndale 2013. There is still a lot of Yarndale that I haven't covered here mind you, but I'll be spending time during the next few weeks working on multiple official write-ups and reviews for the Yarndale website, social media and press. Thanks to our talented photographer Jon, we have a shed load of wonderful photographs of the festival which I'll be helping to bring together for Yarndale's online gallery. 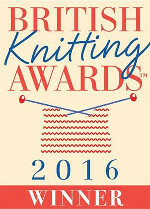 I'll be writing more about the tea cosy competition, the knitted displays we organised, our ongoing partnership with Oxfam, the workshops, the best-in-show award....oh there's lots still to chatter about! But I shall be doing that over on the (rather neglected) Yarndale blog and getting back to normal here in the Attic. I have New Yarn in the house folks, and a completely new project just starting on the hook......tis rather absurdly exciting in my hooky world right now! I so wished I could have come but your too far away plus I have agoraphobia. Im so jealous of all the people that got to meet you!! as for autographs I would have been utterly beside myself if id got one as its totally thanks to you that I can crochet !! Congratulations Lucy on a job well done..
Lovely colors, beautiful little corner you had. I say, the blanket covering the chair, is that a series of tunisian blocks? I think that what you did is amazing. Just amazing. I've been reading your blog right from the start and I just want to say how proud I am of everything that you have achieved. Yarndale represented the very best of the blogging community - thank you for the hard work that you have done over the years - creating, writing, sharing so generously. Yarndale was the huge achievement of the whole event team but it was built on a foundation of Attic 24 and your extraordinary gift for communicating the warmth of your personality. Many, many congratulations. I had a wonderful day at Yarndale, my thanks to you all for organising it. Thanks for sharing your experience of Yarndale, and for sharing yourself so generously AT Yarndale. Your corner was fanTAStic and I'm sure many people, like me, were rather overwhelmed by the opportunity to see and touch (gently!) your beautiful creations in real life. Your chicken brooch pattern is lovely - made it for a friend's birthday just the other day... and now I may have to make one for myself too! Lucy it was a pleasure to meet you, you were as natural and friendly as you are here in Attic24. I had such an amazing weekend (my blog post was done in 3 parts and I was only a visitor, I'm sure your memories could fill a book). Thank you to you and the team, it was wonderful, it really was. I do hope we can do it all over again in 2014. This is spectacular! How garland! What more beautiful garlands! and all the decor! I would have been happy if I were come to this festival! congratulations on a job well done! Wow! What a truly fabulous event. You must be so very proud of it. I just wish I didn't live on the other side of the world - I would have loved to have visited!! The bunting pics in your previous post were fantastic. What an amazing story of international support. I loved it. Have a fab weekend hon. I'm feeling all inspired now having caught up on your posts. So I'm off to make a cup of tea and grab my hook. Great to read about yarndale. That is a lovely photo of you . That smile is so content. I love it. Lucy, Great. Brilliant. If you knew then what you know now, would you have undertaken all that with only a team of seven? You have all worked wonders. My Mum got taken into hospital the day before Yarndale started so I couldn't be there. PLEEAASSEEE do it again next year!! Querida LUcy no podre agradecero suficientemente lo feliz que he sido durante la celebración de Yarndale 2013. El reportaje fotografico como siempre precioso. Me ha traido una sonrisa a mi cara. WOW OH WOW!! So wish I could have been there. Yarndale looks to me like it was a rousing success, thank you for sharing your pics with all of us!